May 11, 2007: Picture this: You're one of several astronauts homeward bound after a three-year mission to Mars. Halfway back from the Red Planet, your spacecraft starts suffering intermittent electrical outages. So you remove a little-used service panel to check some wiring. To your unbelieving eyes, floating in midair in the microgravity near the wiring is a shivering, shimmering globule of dirty water larger than a grapefruit. And on the wiring connectors are unmistakable flecks of mold. That actually happened on the Russian space station Mir. When Mir was launched in 1986, "it was as clean as the International Space Station when it was launched," recounted C. Mark Ott, health scientist at Johnson Space Center in Houston, Texas. And the cosmonauts aboard Mir (just like the astronauts from the U.S. and other nations aboard ISS) followed a regular schedule of cleaning all the space station's surfaces to prevent the growth of bacteria and molds that could jeopardize human health. Yet, wherever humans venture, microorganisms follow—and make themselves right to home, thank you, if conditions are right. 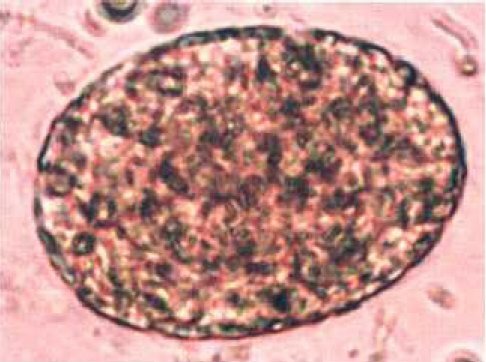 In the late 1990s, NASA joined the Russian space program in its evaluation of the microbial activity aboard Mir. For planning long-duration missions, they wanted to learn about the kinds of organisms that can grow in spacecraft occupied for long periods of time and where air and water are recycled. 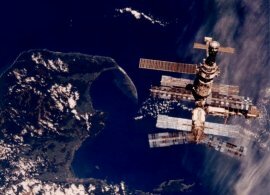 They were especially interested because several times during its 15 years in low Earth orbit, Mir had had the misfortune to suffer several power outages, so the temperature and humidity rose well above normal levels and air circulation was inadequate until the electricity was restored. In 1998, U.S. astronauts participating in the NASA 6 and NASA 7 visits to Mir collected environmental samples from air and surfaces in Mir's control center, dining area, sleeping quarters, hygiene facilities, exercise equipment, and scientific equipment. Imagine their surprise when they opened a rarely-accessed service panel in Mir's Kvant-2 Module and discovered a large free-floating mass of water. "According to the astronauts' eyewitness reports, the globule was nearly the size of a basketball," Ott said. Moreover, the mass of water was only one of several hiding behind different panels. Scientists later concluded that the water had condensed from humidity that accumulated over time as water droplets coalesced in microgravity. 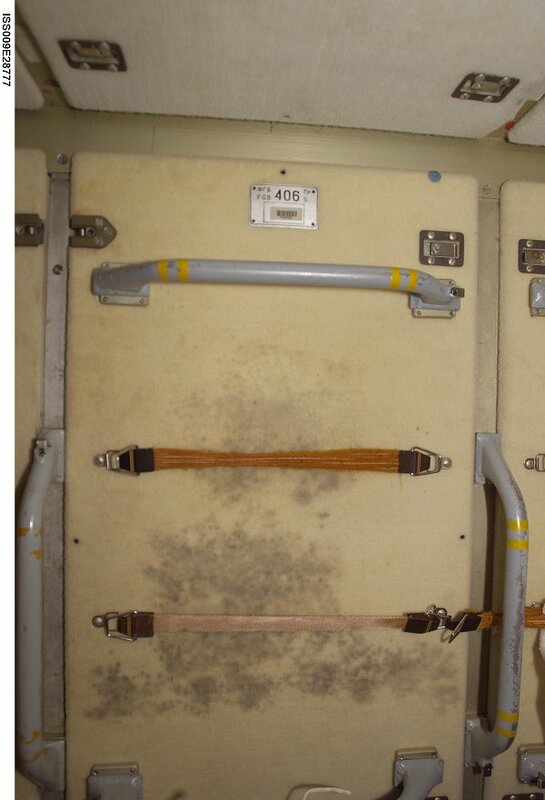 The pattern of air currents in Mir carried air moisture preferentially behind the panel, where it could not readily escape or evaporate. Nor was the water clean: two samples were brownish and a third was cloudy white. Behind the panels the temperature was toasty warm—82ºF (28ºC)—just right for growing all kinds of microbeasties. 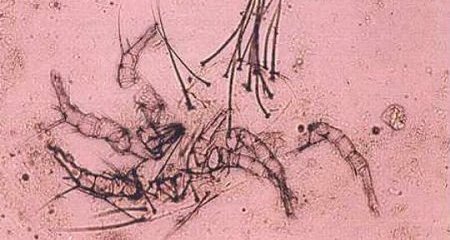 Indeed, samples extracted from the globules by syringes and returned to Earth for analysis contained several dozen species of bacteria and fungi, plus some protozoa, dust mites, and possibly spirochetes. But wait, there's more. Aboard Mir, colonies of organisms were also found growing on "the rubber gaskets around windows, on the components of space suits, cable insulations and tubing, on the insulation of copper wires, and on communications devices," said Andrew Steele, senior staff scientist at the Carnegie Institution of Washington working with other investigators at Marshall Space Flight Center. 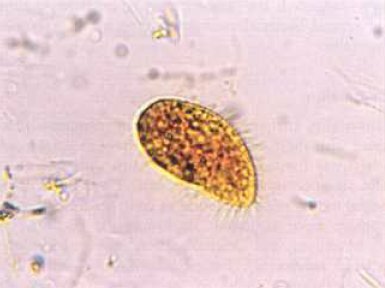 Aside from being unattractive or an issue for human health, microorganisms can attack the structure of a spacecraft itself. "Microorganisms can degrade carbon steel and even stainless steel,” Steele continued. "In corners where two different materials meet, they can set up a galvanic [electrical] circuit and cause corrosion. They can produce acids that pit metal, etch glass, and make rubber brittle. They can also foul air and water filters." In short, germs can be as bad for a spacecraft's health as for crew health. That's one reason that Marshall is developing the Lab-On-a-Chip Application Development–Portable Test System, or LOCAD-PTS for short. LOCAD-PTS is a handheld device that can diagnose the presence of bacteria or fungi on the surfaces of a spacecraft within minutes, far more rapidly than standard methods of culturing, which may take several days and may require return to Earth for further analysis. "LOCAD-PTS is an excellent example of the kind of hardware astronauts will need to be autonomous in a lunar habitat or a long-duration mission to Mars," Steele explained. "Crews must be able to make assessments on their own. They may not be able to get samples back to Earth." Although no electrical or mechanical failure on Mir was specifically traced to biodegradation, "it's not a chance you would want to take en route to Mars." An early version of LOCAD-PTS, which can test for one major category of bacteria (called Gram-negative bacteria, accounting for about half of all bacterial species) is being tested aboard ISS right now. New cartridges for the unit, due to be sent up to ISS in early 2008, will be able to test for almost all major categories of bacteria (Gram positive as well as Gram negative) and also for fungi. Meantime, this fall (2007), an even more advanced version—which can sense 130 specific microorganisms, not just broad categories—Steele will test in the Arctic. 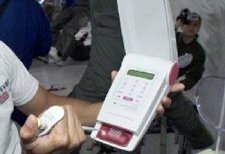 The ultimate plan is to develop a handheld device that can identify thousands of individual microorganisms. "The arrays of tests on LOCAD-PTS can be tailored to look at specific questions," Steele said. "For example, one array might look for genes and chemical compounds associated with biodegradation of a spacecraft’s structure, whereas another array might look for human pathogens, or try to detect life on Mars." By getting the results of the tests in minutes, astronauts would then know which cleaning compound would work best to prevent a spacecraft or habitat from "falling ill."
For a description of the giant water globules found on Mir and the microbial tests on them, see Microbial Characterization of Free Floating Condensate aboard the Mir Space Station by C. M. Ott, R. J. Bruce, and D. L. Pierson, Microbial Ecology, vol. 47, pp. 133-–136, 2004.